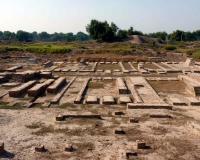 Archaeological Site of Harappa is part of the Tentative list of Pakistan in order to qualify for inclusion in the World Heritage List. If you have already seen Moenjodaro then Harappa is inevitably going to be something of a disappointment. The extent of the site and its remains are much smaller and they lack iconic archaeological features such as the “Great Bath”. Those aspects which are on view might seem a bit minor and esoteric to a non-enthusiast! e. Workers houses - as for the Granary! Within the site there is also the tomb of a local Muslim saint – some local musicians were playing/singing Qawalli type music when we were there. There is also a reasonable small museum at the very entrance of the site containing the usual seals, jars etc and yet another copy of the “Priest King”! The skeletons on display are probably post-Indus however. The state of the site was not of the best – in places it merges with the adjacent modern village and public paths criss-cross it. But we saw no evidence of the abandoned “amusement park” construction of 2005 which so concerned UNESCO when Pakistan was considering how to progress a nomination. There were also areas where the mound seemed to be eroding and uncovering what could be significant remains. Regarding its nomination history - It was rejected back in 1980 when nominated alongside Moenjodaro but I haven’t been able to discover the reason from those earliest days of the scheme. In the same year Lahore Fort and Shalamar Gardens were separately nominated but “paired” by the WHC so it was certainly “open” to the WHC to do the same in this case too. Since then UNESCO appears to regret not having a better representation of Indus Valley sites on the Inscribed list and has encouraged Pakistan to extend the Moenjodaro inscription with a single extension of 3 other Indus Valley sites, including Harappa, even though Pakistan still leaves each of them on its T List as a separate entry. The agenda document for the 2007 WHC, indicating which sites have met the initial criteria for being considered at the 2008 WHC, records that Pakistan had submitted an incomplete dossier for this extension on 30 Mar 2006 – itself of course just 2 months too late to have been considered at the 2007 WHC. Now this is exactly the same deadline “failure” as Pakistan had in relation to its Haran Minar application. One begins to wonder whether its bureaucracy deliberately makes sure that it fails to meet such deadlines so that its staff can portray the impression of frenzied activity whilst not actually being called to account on the substance of the nomination! But that is probably unfair and this list of reports in Dawn over the past 10 years gives a wonderful insight into the long running saga in which Pakistan seems genuinely to try to produce a set of documents for these sites which will satisfy UNESCO!! Year after year there are reports of “hectic” rushes to provide information in time, followed by reports of the Archaeology department’s failure to do so. I particularly like the “doom and gloom” report of 18 March 2012 followed by that of 21 March in which UNESCO clarifies matters - “It was only a technical rejection”!!! You really would think that, between them, UNESCO and the Pakistan government could sort this matter out. UNESCO clearly wants the sites “inside the fold” but doesn’t seem to be able to give Pakistan any practical help to do so! Pakistan seems to regard the problems as “bureaucratic” in terms of correct paperwork or information but I suspect that the difficulties run somewhat deeper and demonstrate that the sites have genuine maintenance problems which even perfect paperwork couldn’t hide.